Helping protect the environment has been important at Holland Imports throughout our company’s 40-plus year history. Holland Imports and XYNYTH believe in the same value; providing effective yet affordable products that are unharmful to our environment, preserving a sustainable ecosystem. For that reason, we have partnered with XYNYTH to be our exclusive source for environmentally friendly ice melter. It’s important that end-users understand that not all ice melt products are the same, and just because an ice melters colored green, does not mean it’s an eco-friendly product. The No. 1 selling item at XYNYTH remains the company’s prominent Mountain Organic Natural Icemelter™. It’s specifically designed to melt ice and snow effectively, while posing no risk to users, pets, concrete or the environment, when used as directed. 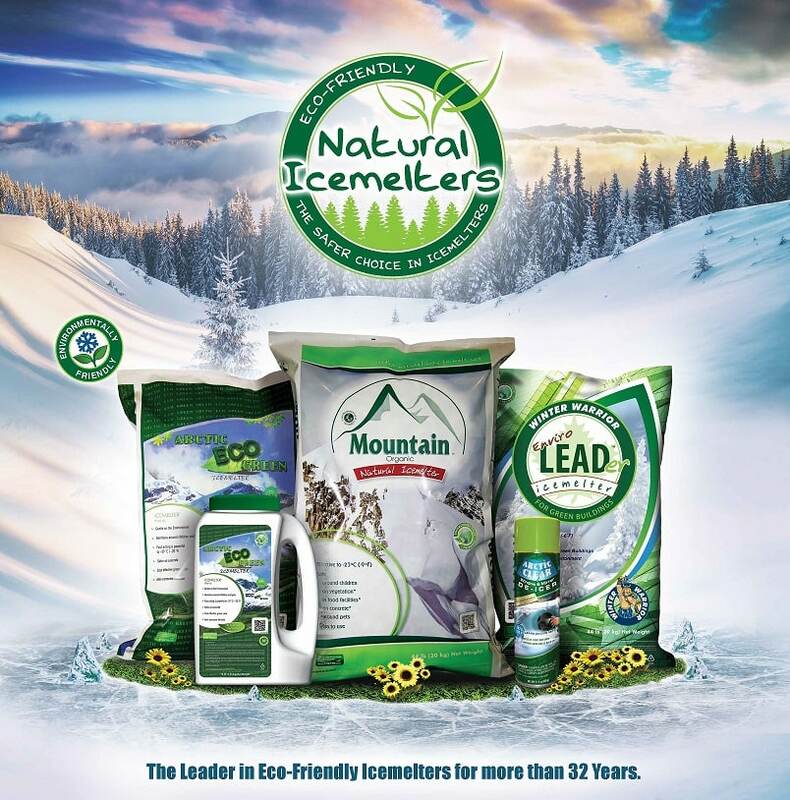 Fertilizer-based Mountain Organic Natural Icemelter™ begins working immediately after application and is effective to -23°C (-9°F). It also boasts an unlimited shelf life and is completely safe for those handling the product. Due to its potassium content, Mountain helps repair damage caused by long-term use of environmentally harmful de-icers, such as rock salt. There are people in the marketplace today who want to use environmentally friendly products, but the challenge is that a number of these consumers don’t want to spend extra money. XYNYTH’s range of ice melters are designed with the environment in mind, while also focusing on price. They products are layered with various ingredients that provide many attributes, such as an anti-corrosive feature. One product XYNYTH introduced, Arctic ECO Green Icemelter™, uses a special encapsulation process taking sodium chloride and encapsulating it with CMA (Calcium Magnesium Acetate), which helps eliminate the negative side effects of the sodium. By still using sodium chloride, XYNYTH officials can bring the cost of the product down. If you are interested in purchasing one of their ice melters, please contact your sales rep or our sale desk. Be safe this winter!